There really isn’t much of a time line to these, just pictures of things I noticed while walking. I snapped some of these while walking towards the park where Liam could play. Others I snapped on the way home from the 回転寿司屋 (Conveyor belt sushi restaurant). 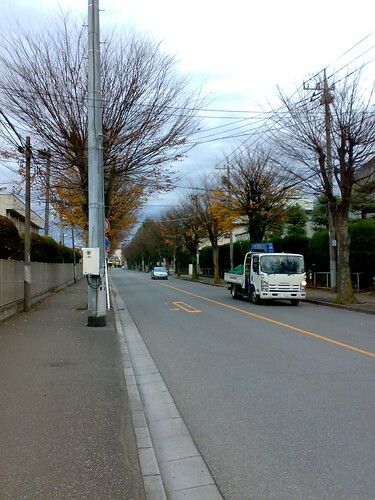 We begin this walkabout on the industrial strip in Kawagoe and Sayama cities. 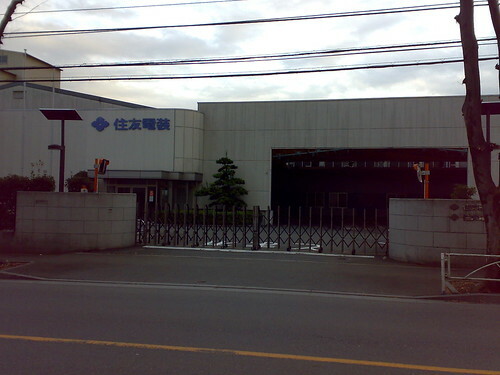 I interned with Sumitomo in Nagoya back in 2002. 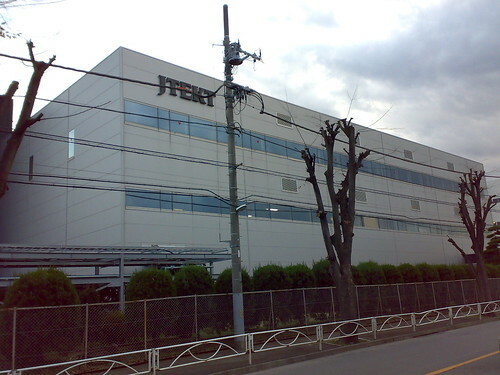 Sumitomo is everywhere in Japan, and in this industrial park alone they have a logistics center and then this electrical machinery factory. 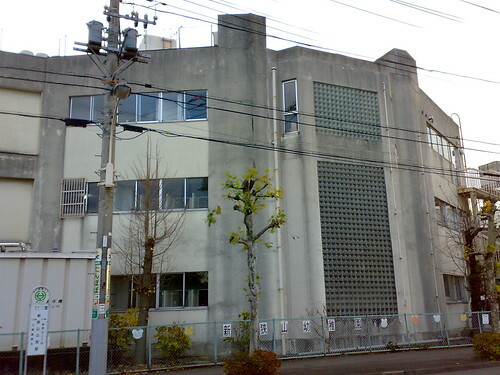 A typical industrial Japanese office – aluminum panel siding with windows that may or may now open. Of course inside the traditional island desk layout is used. I spent my first two years working in an antenna company that had an industrial office quite like this. A smaller enterprise tucked away in the industry park. Despite the image of Japan as a place of large corporations with loyal employees, there is an ever-growing number of entrepreneurs starting up their own companies and trying to do things their own way. 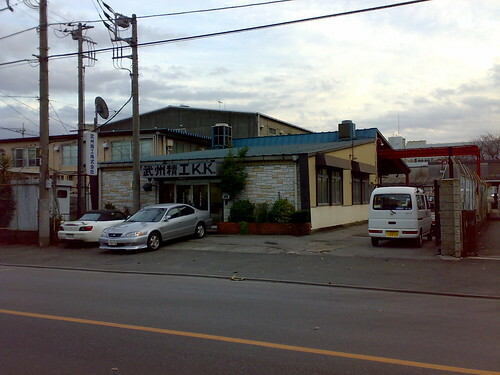 I worked in both the large traditional style company and the small, single-owner company. The styles were completely different, but Japanese business culture is still large the same. 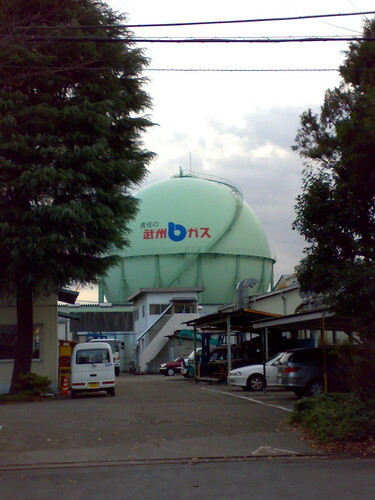 武州 (Bushu) Gas, the local supplier of gas for industry and residential sites. I was a loyal customer for nearly two years, their gas powered my single burner stove and the hot water to my bathtub and shower. This giant orb sits in the industrial park, but residential areas are not far away, just two blocks actually. When I lived in Kawagoe, I always wondered about how safe such structures are with respect to earthquakes. After what happened this past March, it makes me wonder even more. An empty 公団 (Public housing site) – this unused facility sits on prime real estate just three by foot from the train station. There are many such sites in Japan, and I always wonder what the government is doing with these empty buildings. 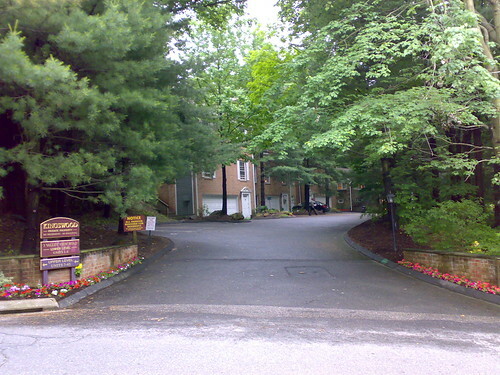 Not all public housing looks like this, however. This is just an old building that has served its time. I think this modern design and the colors, it stands out fr0m the traditional style Japanese house, as can be seen on the left. 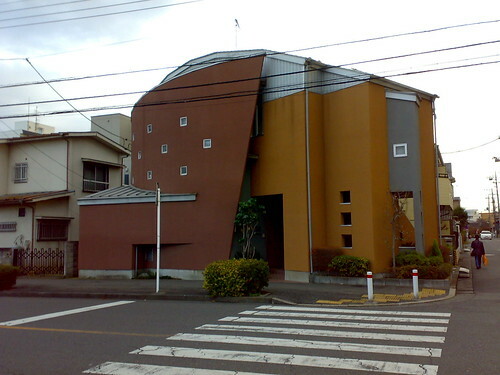 Japan has neighborhood associations, but there is no all-powerful Home Owner’s Association that can tell you what type of style house you can build, what colors are permitted, and what you can keep on your property. Because the Japanese usually build a house and live in it their entire lives, they have a lot of freedom to do what they want. 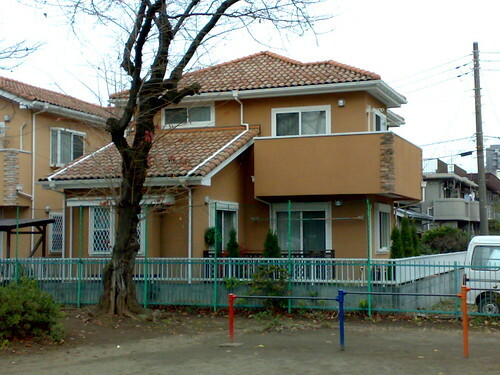 Most Japanese don’t like to buy used homes anyway, so there isn’t any worry about resell value. Not public housing, but close! 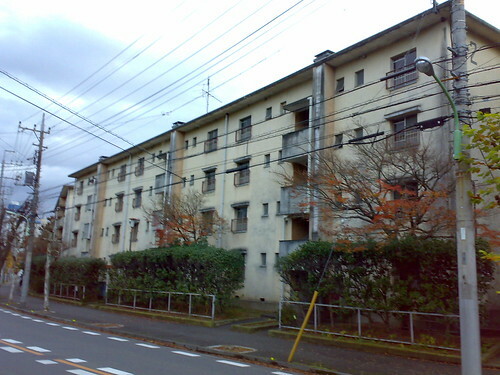 This is an NTT employee dormitory – yes, it looks old and not very nice. But employees can live here a few years for little to no rent, allowing them to save money to buy their own home in the future. Another typical Japanese home – the pole across the sliding door on the first level is for hanging the laundry to dry. The balcony on the second level probably also has laundry hanging facilities, and one can also hang the futon over the edges to let the futon air our during the day. A very functional home if I do say. 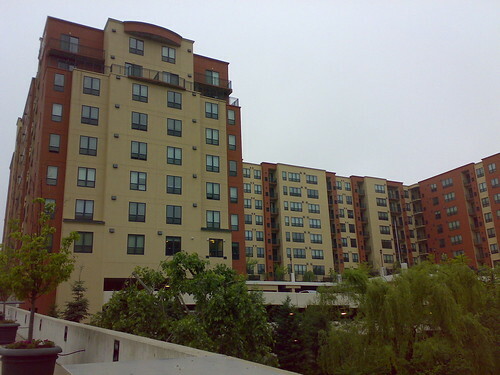 Public housing is a good option for foreigners actually. 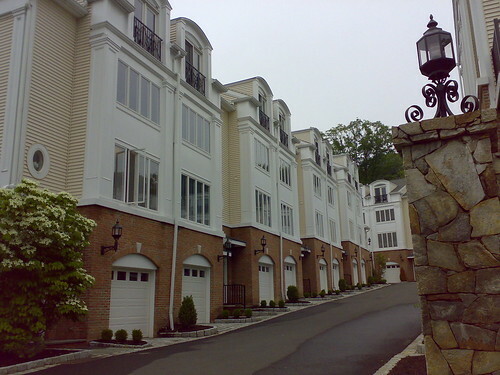 While privately-owned apartment complexes are supposed to be fair and there is not supposed to be discrimination, I experienced it first hand and was turned away from a place I could have easily afforded just because the owner did not want to rent it to me. The owner eventually ran out of excuses and it was clear he just didn’t want to rent it to me. With public housing, any one who can pay is eligible and there is no gender, race, or nationality based discrimination. You also don’t have to pay ridiculous fees like key money or have been in the same job for X number of years. 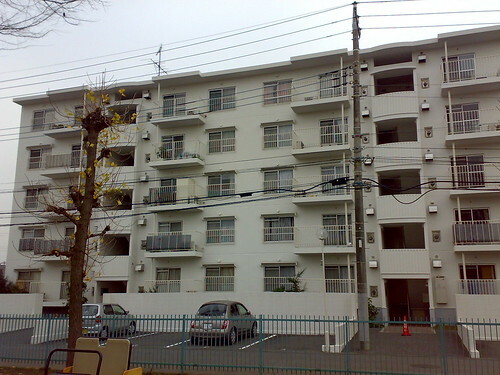 Public housing in Japan is also very safe and completely different from that of the USA. 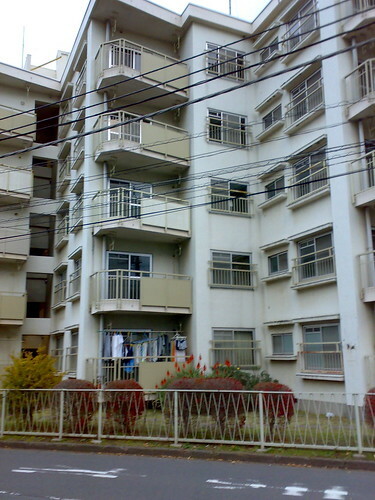 You won’t find gangs, drugs, and violence in Japanese public housing. 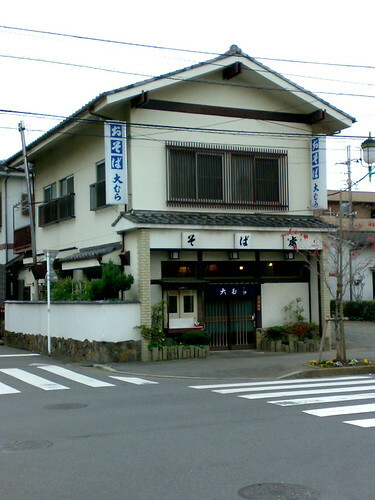 Family-run そば (soba) shops are all over Japan…it seems like on every street corner even. I often wonder who their clients are and how they can stay in business. I suppose they thrive off of local workers looking for a place to eat lunch every day. 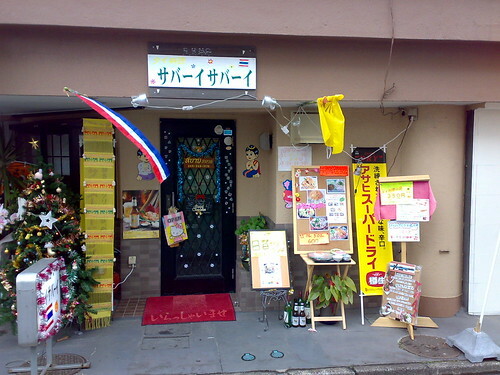 This shop is called “Sabai Sabai”, which means “Hello Hello” in Thai. This restaurant had popped in the time I had left. 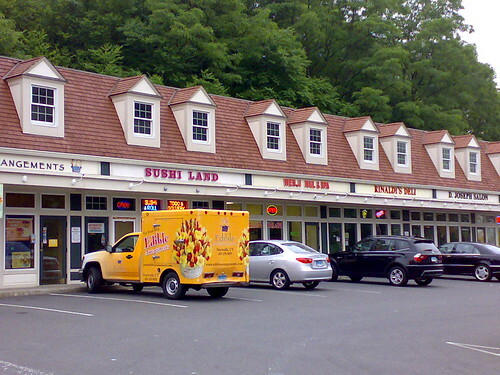 The restaurant has a very reasonable lunch menu at very reasonable prices. Pad Thai please! They also advertise that they serve Asahi Super Dry beer. I never really could taste the difference in Asahi and Kirin beer, but some guys swear by one brand. When I lived in Nagoya, whenever we went out for drinks, we had to order Kirin beer only. Apparently Sumitomo and Kirin had some sort of agreement, and we had to find a place that served Kirin beer. I believe we had some sort of discount because of it. I never understood how it worked, but the Sumitomo guys were serious about Kirin beer. I just love these gray buildings, they fascinate me. The sign on the fence talks about a 新狭山幼稚園 (Shinsayama Kindergarten) and my draw dropped….could this be a kintergarten? Poor kids, not a very happy looking place! As I turned the corner I saw the kindergarten just past this building. Phew! This gray monstrosity is a community center actually, probably only utilized by the retired locals in the area. 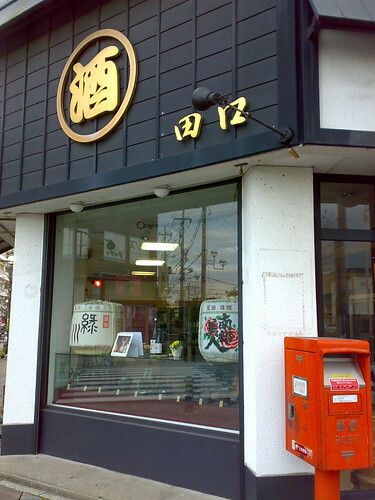 A specialist sake shop – notice the barrels in the window, which is how sake is sold and packaged in volume amounts. No, I doubt you can purchase one like a keg, the barrels are probably just for display. You can often see such barrels of sake stacked up at famous temples and shrines. I just had to squeeze the mini post box in the picture too. I really do miss Japan for its restaurants and dining out. In the USA you cannot escape a restaurant without paying $40 these days, even just a simple place like a Pho shop. At this 回転寿司屋 (conveyor belt sushi shop), during the afternoons all sushi is just 100 yen per plate, or about $1 per plate. Of course the green tea is free, unlike in the USA where you have to pay $3 for a glass of tea. 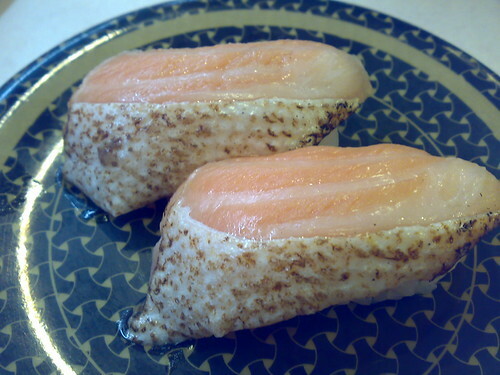 My favorite sushi – ねぎとろ. 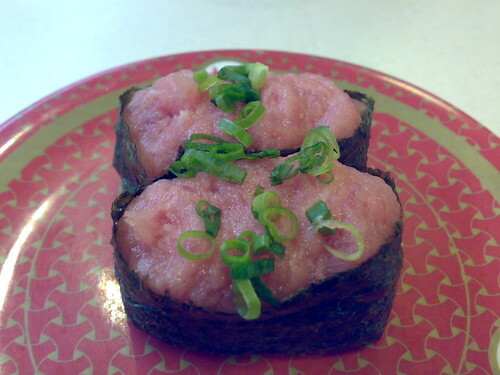 It is just minced tuna served with shopped green onions on top. In may conveyor belt sushi joints, they don’t put wasabi on it as this sushi is popular with kids. I am a simple person really. 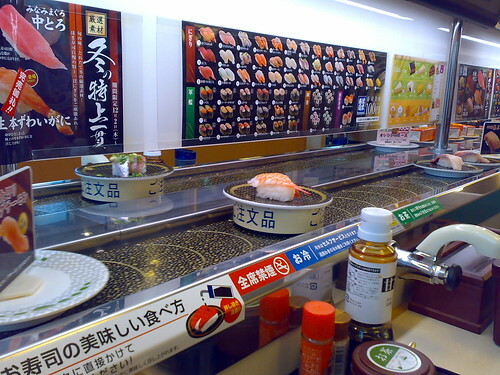 Many conveyor belt sushi places are starting to sell cooked items as well as the raw fish. Above is my wife’s favorite, charcoal grilled salmon. It is so tender and juicy, I high recommend it! I have also seem カルビ (Korean galbi — Korean BBQ style beef) too. 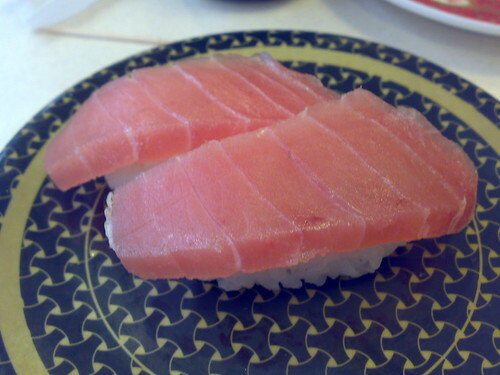 Regular 鮪 (maguro – tuna) Yes…I’m one of those contributing to the depletion of the giant tuna in the ocean waters. I’ll quit eating tuna when everyone in America gives up their steak. I stumbled across the video of an morphing 344 sq. ft. apartment in Hong Kong designed by an architect so that it can transform into whatever type of space he needs. I thought this was a very novel idea for dealing with the small spaces and high real estate costs in Hong Kong. If I were a bachelor again, I’d love an apartment like this. However, I’d be out of luck when it comes to cooking–I don’t think I could go back to cooking on just one stove burner. But then again, eating out in Asia is very affordable and often what most bachelors do. I thought the movable walls were a very interesting idea, and it reminds me somewhat of my first apartment in Japan. Of course my first apartment was in a old building with old amenities and not anywhere as nice as this! My apartment had a bed mounted to the wall that would rise to the ceiling so that when it was not in use, the space occupied by the bed could be freed. It also permitted access to the closet. Looking back now, it was very nice, as I was always annoyed in my other apartments having to put away my futon. Recently I stumbled onto a very interesting photo thread on Baltimore over at City-Data, a rather US-centric website with tons of statistics on North American cities as well as user web forums. 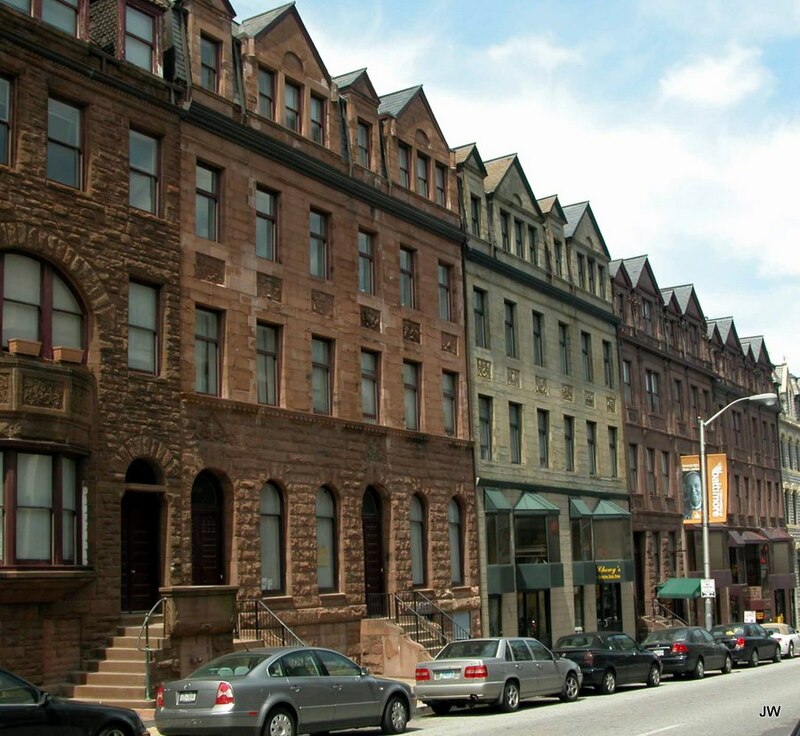 There are plenty of pictures that help you get a feel for Baltimore’s architecture and its history. I suppose that Baltimore, just a stone’s throw away from Washington DC, is not well-known outside of the eastern part of the US. 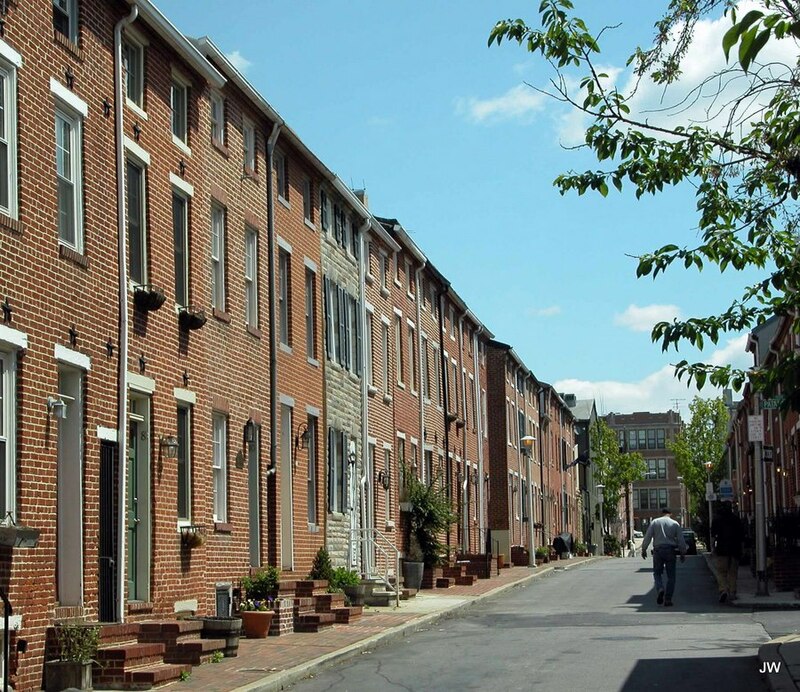 Like so many of the cities along the mid-Atlantic coast, Baltimore has a rich history in the early part of the US and was famous as a port city and for its shipbuilding industry. Shipbuilding has all but left North America now, and Baltimore seems to be stuck in a downward spiral for the past few decades. 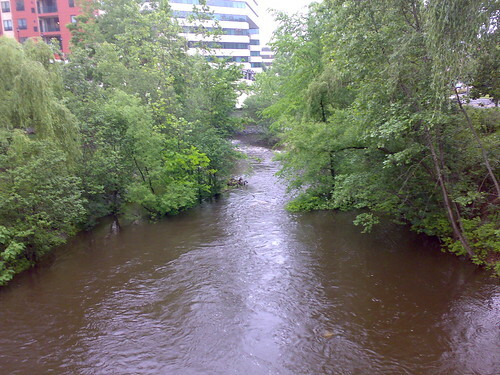 These days it is famous for its crime and its popularity with hippie artists looking for a bit of culture and history at a reasonable cost of living. Nonetheless I really enjoyed the photos that the original photographer, JW, posted. I’m going to “borrow” a few examples, but do check out the other pictures if you’re interested in architecture and housing. 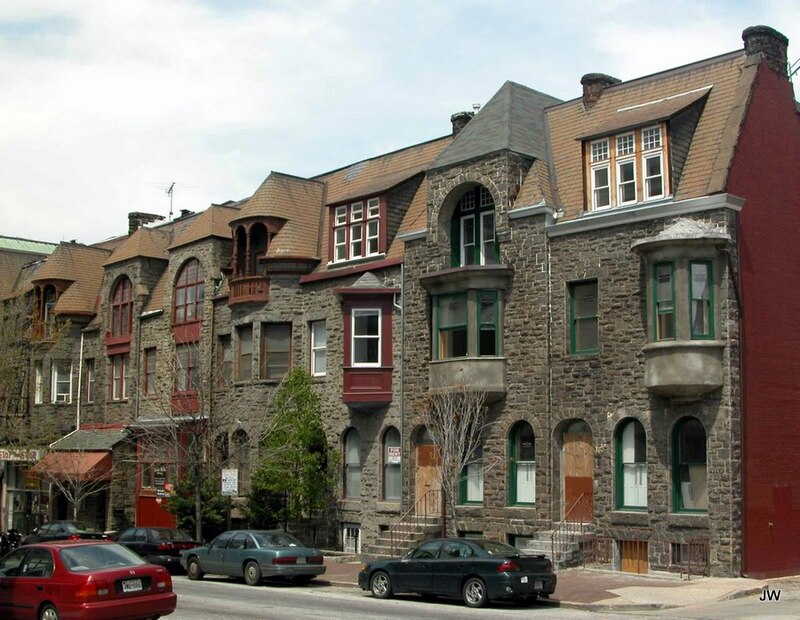 Some will make you cringe, like the pictures of dilapidated old houses in the ghettos, and others will leave you surprised at what Baltimore has to offer. You would be forgiven if you thoguht this was Backbay in Boston. It lacks the hills and the greenery of Backbay, but is nonetheless just as splendid and historical. I’d rather like to visit Baltimore for a day trip after seeing these photos. Here’s to hoping that the city can eventually get a grip on its crime problems and move forward in the future.